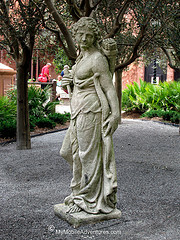 After a bit of research, I am unable to determine why Diana was chosen to grace the Tuscan garden. She’s not especially connected to Tuscany. In fact, most of the known shrines to Diana in Italy stand significantly further south. This will have to remain a mystery – perhaps it’s simply a random selection by the CM who themed the garden. 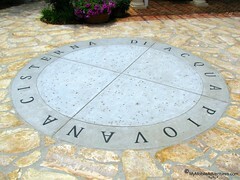 Although I did study Italian briefly in school, that was many years ago so I needed to take a photo of this phrase written in the round on the patio. It was the word “piovana”, which I’d never heard before, that was baffling me. When I got to a computer, I googled it. “Cisterna di acqua piovana” means “reservoir of rain water”. I guess the implication here is that the reservoir is sunken into the ground. I’ve heard that’s a bad thing to do with your rainwater if you’re going to consume it in some way, but I guess if you’re only going to use it to water the plants and you don’t actually drink it or bathe in it or use it to cook, then it is probably ok. So far we’ve only seen a sign with a reference to “acqua” or “water”. Now we’re going to see the actual water. You may have to click the picture and view it in a larger size to see. 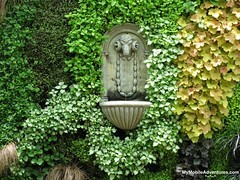 Here it is – a fountain mounted on a wall of ivy, in the shape of a ram’s head. See that trickle coming out of his mouth? That’s water! I know, it’s barely a trickle but it is actual, genuine water! There was much more to this outdoor living space, but I will save those photographs for another day.